I came across this story whilst visiting the Museum of Flight at the San Pelagio Castle just outside of Padua. The museum turned out to be a quirky place with a huge aviation and flight-related collection (whole planes and helicopters included), all housed in a romantic Italian castle surrounded by lush gardens. Among all the artifacts, photographs, human-size models of famous pilots, air balloons and other strange aircraft, something caught my eye and made me stop in my tracks. It was this figure of a pigeon with a camera attached to it. ‘Look, the earliest drone!’, I pointed the pigeon to my husband. As a matter of fact, it turned out to be just that. The pigeon photographers were used in both World Wars. Carrying a lightweight camera strapped to their bodies, they would venture over the enemy lines and take pictures of otherwise forbidden areas. Their cameras weighed only 70 grams and would be set to automatically take a shot every 30 seconds at a height between 50 and 100 metres. The pigeons would wear an aluminium breast harness to which the camera was attached. The idea to use pigeons as spies came to one Julius Neubronner first. He was a German pharmacist who would initially use pigeons to deliver prescription drugs. In 1903 he completed the development of a series of photographic cameras specifically to be used attached to pigeons. In 1908 he even patented his invention, no matter how wacky it might have seemed at the start. In fact his patent application was initially rejected. Nowadays, of course, we have drones and satellites for the purposes of reconnaissance. 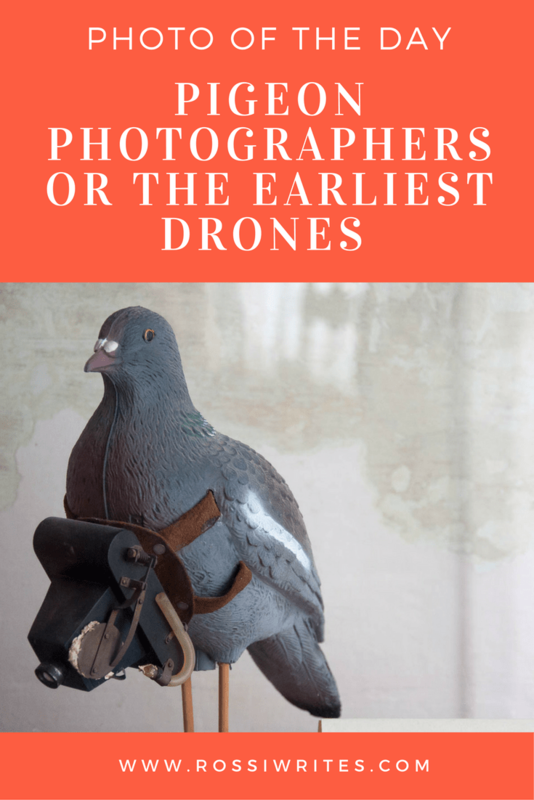 Yet, I thought that the story of the pigeon photographers was a very interesting one and deserved to be shared with more people, so thank you for reading. The Museum of Flight at the San Pelagio Castle is a very interesting and intriguing place. If you are looking for ideas as to where to go and what to do on a day off in the Veneto, Northern Italy, consider paying it a visit. It may just surprise you.